Netflix posted third-quarter earnings and subscriber growth that topped expectations. The streaming giant also warned investors that the costs of developing original content will take a bite out of its profit at the end of the year. Wedbush analyst Michael Pachter, a long-time Netflix bear, cautioned that the company’s content acquisition spending will trigger substantial cash burn for many years. Netflix‘s impressive quarterly earnings and subscriber growth blew past Wall Street’s expectations on Tuesday, causing analysts across the Street to upgrade their price targets. 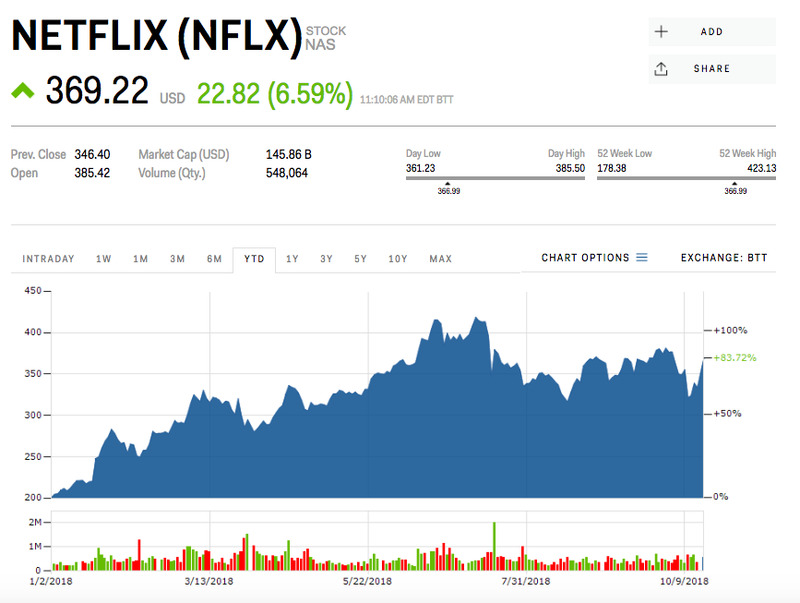 But Wedbush analyst Michael Pachter, a long-time Netflix bear, cautioned that the company’s cash burn remains a big problem for the video-screaming giant. “We expect content acquisition spending to trigger substantial cash burn for many years; notwithstanding three Netflix price increases in the last five years, cash burn continues to grow,” Pachter said in a note sent out to clients on Wednesday. The tech giant on Tuesday said it earned $US0.89 per share, 30% above what analysts had expected. Netflix also added 7 million subscriber during the third quarter, well above the roughly 5 million expected by analysts. It also guided above Wall Street estimates for next quarter. However, the streaming-media giant warned investors that the costs of developing original content will take a bite out of its profit at the end of the year. The management added that its cash burn will hold steady at $US3 billion for fiscal year 2018, and currently sees next year’s negative free cash flow as roughly unchanged. Pachter explained that Netflix’s cash burn is likely hold steady this year because Disney and Fox are likely to migrate content that is currently licensed to Netflix to a Disney-sponsored standalone service next year. “The silver lining is that Netflix will have less content available to it, resulting in more stable cash burn; unfortunately, this subjects the company to the potential for slowing subscriber growth should its original content offering fail to achieve the quality and quantity of the lost content,” Pachter said. He believes a reversal of the company’s multi-year cash-burn trend is “imminent” as management has said the trend of a climbing cash burn has “plateaued” at $US3 billion per year. As a result, Pachter lifted price target to $US150 from $US125 – 60% below where shares were trading Wednesday – to reflect better-than-expected subscriber growth and the possibility that Netflix’s free cash flow will stabilise. He reiterated his “underperform” rating. Netflix was up 84% this year.